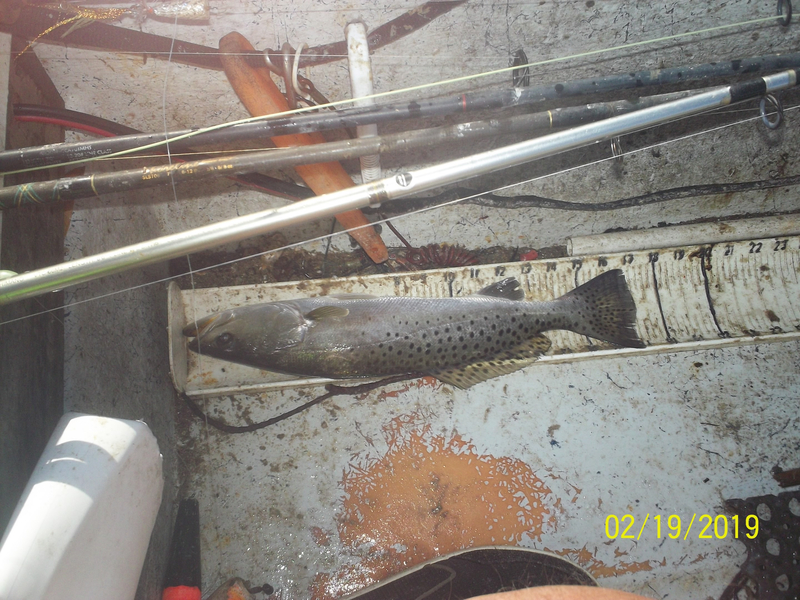 19 Feb 2019...Wabasso/Vero...Trout, Trout and more Trout. First stop, Pine Island. Popping cork with a Matrix Shad 18 inches down, pair of short Trout. Tide starting to run hard, move to the Hobart Flat. 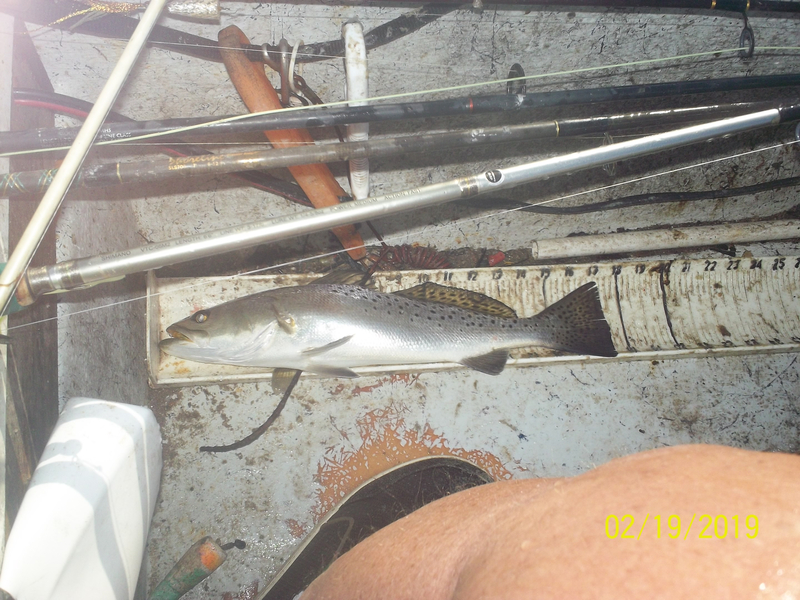 Three medium Sail Cats and six slot Trout. 17 inches biggest, a little on the anorexic side. Noticing parasites on the bottom side of the Trout. Skip the Sisters and Spoil Islands, hoping to get under the Golf Cart Bridge, not enough clearance. Rising tide, would not be able to get back out. Snapper in the canal getting scarce. Shark ate a Baby Vudu, no slash or smash, just got heavy and gone. Small Jacks and Snapper still feasting on Glass Minnows under the real bridge. Move out to the Grand Harbor South Flat. Two schools of slot Trout, play with a few and leave. Checkout Chambers Cove and Stingray Creek. 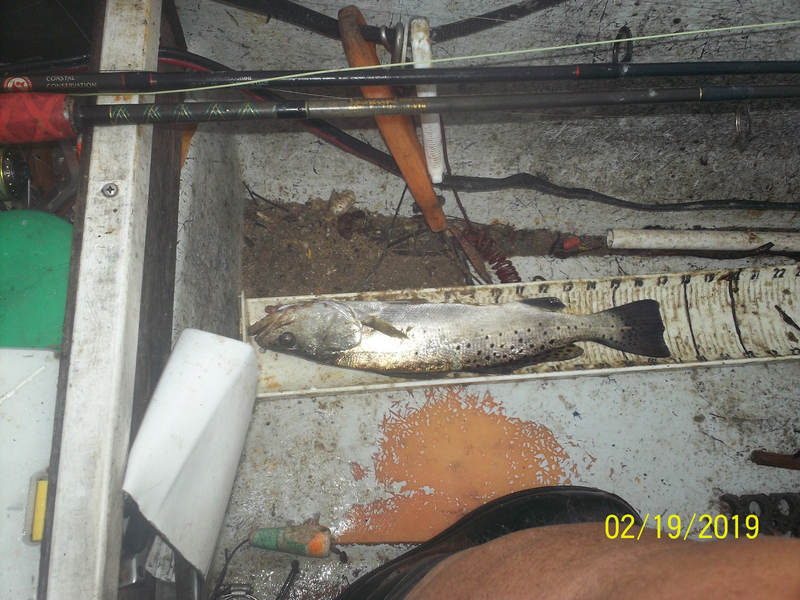 Nothing inside, but again, slot Trout were hanging off of the inside drop on the outside flat. Estuary flat, more slot Trout. Nothing in the Johns Island/Vero area. Spotted a group of 3 and another of 5 big Snook lurking in the Mangroves. No players. Stop at Hobart on the way home, still Trout City on the flat. Total of 30 slot Trout on the day. Biggest 19 inches. Will take a little more practice to get the popping cork working better, averaged somewhere in the 80% range for landed fish. Saw quite a few parasites on the bottom outside of the Trout. Tiny white creatures. All players released for another day. I see you are giving a presentation at the fishing club meeting this month. Gonna give away all the top secret spots, plus how to get 15 # Snook out of the Mangroves on 4 # test. See if I can have as much fun as I did in Orlando at a show.